Rajasthan Royals 6-173 (Sanju Samson 63, Shane Watson 41, Ravi Rampaul 2-28) beat Royal Challengers Bangalore 6-171 (Chris Gayle 34, Virat Kohli 32, Shane Watson 3-22) by four wickets. A stylish knock by Sanju Samson and an all round performance by Shane Watson, lifted Rajasthan Royals, who won a thriller against Royal Challengers Bangalore. Royal Challengers Bangalore scored 171 runs with four wickets intact at the end of the measured 20 overs and Rajasthan Royals smashed 173 after losing six wickets and one ball to spare. 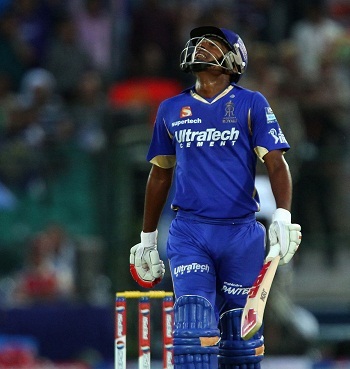 Sanju Samson (Rajasthan Royals) was declared ‘Player of the match’ for his crunchy knock of 63 from 41 deliveries. 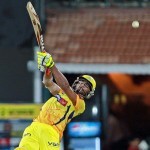 The 40th match of the Indian Premier League was played on Monday, April 29, 2013, at Sawai Mansingh Stadium, Jaipur. Earlier, Rahul Dravid won the toss for Rajasthan Royals and asked Royal Challengers Bangalore to go for batting first. Abhinav Mukund came into bat with Chris Gayle who started up in his usual aggressive style by hitting 3 fours in the very first over. 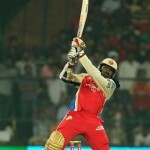 Gayle teased Sreesanth in the third over with 1 six and a couple of fours as Mukund got his first boundary in the fourth over. 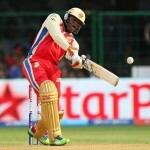 Gayle was caught behind by Sanju Samson off Shane Watson for 34 from just 16 balls with 1 six and 6 fours. The skipper of Royal Challengers Bangalore, Virat Kohli dropped in next as Abhinav Mukund became the second victim at 66 for 19 runs. AB de Villiers walked in next while Kohli kept on creeping at his end and the score reached 75 after 10 overs. The pair scored 16 runs in the next over with 3 fours as de Villiers was gone at 99 in 12.1 overs after contributing 21 runs. Moises Henriques got together with Kohli who added 12 runs in the 14th over with the assistance of 2 fours. Henriques hit the first six of the day in the 16th over as Virat Kohli was caught by James Faulkner at long-on at the bowling of Watson for 32 runs. Moises Henriques was run out for 21 as the rival bowlers got a couple of quick wickets. Vinay Kumar punished Faulkner for 22 runs in the final over with 3 lofty sixes as Royal Challengers Bangalore scored 171 runs for the loss of six wickets in 20 overs. Shane Watson was the supreme bowler with three wickets whereas Sreesanth and Siddharath Trivedi claimed one wicket each. Rahul Dravid and Ajikya Rahane opened the innings for Rajasthan Royals and the latter was dropped on the first ball by Kohli at the second slip off Ravi Rampaul. Dravid utilized the chance by getting 2 fours in the same over followed by another two boundaries in the next. Rahane went back to the pavilion for just two runs and was replaced by the 18-year-old Sanju Samson who hit 2 back to back fours in the fourth over. Samson was dropped at 12 in the slip by Gayle off Moises Henriques and the batsman replied with another 2 fours in the sixth over. Rahul Dravid was clean bowled by Henriques for 22 as Shane Watson appeared on the scene. Samson was batting at his best and hit 2 consecutive sixes to Murali Karthik and Watson got his first four in the next over. Sanju Samson plundered his fifty on the 32nd ball with a four and accumulated nine runs in the 14th over with 2 fours. Samson was finally caught by Karthik off Rampaul for 63 from just 41 deliveries with 2 mighty sixes and 7 fours. Brad Hodge and Watson added 22 runs in the next two overs comprising 1 six and 1 four. The 18th over resulted in 17 runs with 2 crunchy sixes from Hodge as Rajasthan Royals required 13 runs to win the game in 12 balls. Shane Watson was caught behind by AB de Villiers off RP Singh for 41 scored from 31 with 1 six and 3 fours. The stumps of Brad Hodge were destroyed by Vinay Kumar for 32 off 18 mere balls with 2 sixes and 1 four. Stuart Binny hit the winning four as Rajasthan Royals hammered 173 runs with four wickets in hand in 19.5 overs. Ravi Rampaul was the top wicket taker with two whereas RP Singh, Vinay Kumar and Moises Henriques shared one wicket each. Rajasthan Royals won the crucial match with a margin of four wickets and stand in the third spot with 12 points from 9 games.